PhaTStuff Designs is a Shropshire based Graphic & Web Design Company that specialises in Small Businesses, Sole Traders and Freelancers in the UK. We also offer Social Networking Support to help set up your business social profiles pages. 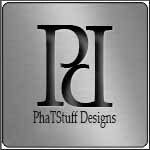 All our packages are tailored to the exact needs of the client with both service and price PhaTStuff Designs was set up because although there are a vast number of Graphic & Web Design company's on the net, few offer professional designs with prices and package deals that are affordable to those who have small budgets, we wanted to change that. Our packages deals are designed with you in mind so now matter what size your business, whether you�re a sole trader a freelancer or if you just want to showcase yourself, you can now have a professional designed website, a unique custom designed logo or business cards that jump out from all the rest, all at an affordable price. Make you social network pages stand out with custom design Cover Images for your Facebook and custom designed Header and Background Images for your Twitter pages.